An extensive collection of papers related to Bill and Hillary Clinton's years in the Arkansas governor’s mansion remains under tight control at a public library in Little Rock, with access restricted by the Clinton Foundation. 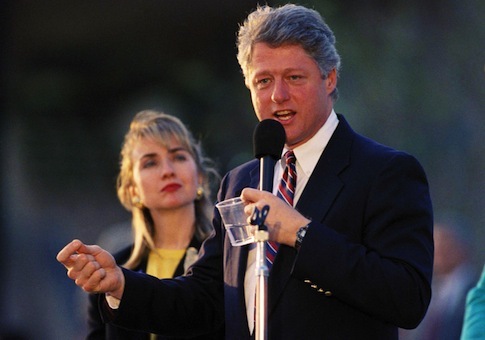 President Bill Clinton donated his papers from his tenure as Arkansas governor to the Central Arkansas Library System (CALS) in 2003, and they are housed at the Butler Center for Arkansas Studies in Little Rock. The documents could provide new insight into the early chapter of the Clintons’ political careers, as reporters take a second look at Hillary Clinton's past in light of the information contained in the public materials of the Diane Blair collection. Hillary Clinton played a key role in her husband’s health care and education initiatives during his time as governor, from 1979 to 1981 and 1983 to 1992. The collection, dubbed the "Clinton Project" by library officials, is still being processed by archivists, but is technically available to public viewing requests. However, access to the documents is tightly controlled by the Clinton Foundation, a nonprofit charitable group founded by President Clinton in 2001, which retains legal ownership of the papers. A CALS official told the Washington Free Beacon last month that any request to view the documents would have to be approved by Clinton Foundation board chairman Bruce Lindsey, a long-time adviser to Bill Clinton. "Bruce [Lindsey] is going to want to know specifically what you want access to and why," said CALS director Bobby Roberts. "Then he is going to contact us to see if we have anything. Only then will he consider giving you access." Roberts added, "The material is housed in hundreds of archival boxes which are closed to the public without the permission of the [Clinton] foundation." Lindsey did not respond to a Free Beacon archive request in January, or to a follow-up request last week. The manager of the archive told the Washington Free Beacon that there "really isn't anything" related to Hillary Clinton in the collection. "[T]here really isn't anything by or about Hillary Clinton in the Clinton collection," said David Stricklin, in response to a request for access in January. "The files are mostly working papers from various staff members. There are no personal Clinton family files in this collection, and, because she was not a member of his staff, my colleague tells me, there are no files related to Hillary Clinton's work." However, CALS director Roberts told CBS in 2007 that there were at least 34 files related to Hillary Clinton in the collection. During Bill Clinton’s tenure as governor, Hillary Clinton spearheaded his education reform initiative and led committees on rural health care and public education. The Butler Center houses gubernatorial papers from six other Arkansas governors. However, Clinton’s papers are the only ones that are subject to such an arrangement, according to library officials. The other collections, including ones that are still being processed, are open to the public. A Butler Center official told the Free Beacon that "there’s been very little use of the documents" in the Clinton collection. "It’s been really spotty," said Glenn Whaley, assistant manager at the Butler Center and a lead archivist on the Clinton Project. "Some years it’s two or three [researchers who are granted access] within a year; some years it’s a little bit more than that." Stricklin acknowledged the difficulty of accessing the documents. "I think the trick is just to get Bruce [Lindsey] to say yes," he said. The difficulty of accessing the papers has frustrated historians. Professor Alan Marcus, head of the history department at Mississippi State University, said he spent four or five years trying to get access to a small collection of papers related to a retreat that Bill and Hillary Clinton attended annually in Hilton Head, S.C.
Marcus said he was told a team of lawyers from the Clinton Foundation would have to vet the documents before they would grant him access. However, the attorneys never showed up at the archive, and Marcus was forced to abandon the project after years of waiting. "Researchers and others wanting to use the papers would have to identify the papers they wanted to see and then lawyers from the Clinton Foundation would come and comb through each page to make sure that the material should be viewed," said Marcus. "There are two lawyers who do that. The problem is that they don't really do it," Marcus said. "With Hillary running for president in 2006 and after, they were vetting her material. When she became secretary of state, they worked with her there." Larry Sabato, director of the Center for Politics at the University of Virginia, said that while it is unclear what is in the gubernatorial archive, the tight restrictions "suggests that the Clinton forces believe problems would result from their publication." The Diane Blair archive, which has been combed through by national media outlets after the Free Beacon reported on its contents earlier this month, has a restricted section, which library officials say is not unusual. Timothy Nutt, the head of Special Collections at the University of Arkansas, where the Blair archive is housed, said typically such sections are only open to the people who donated the collection and their designated agents. Sabato said both the issues raised by the Blair papers and also the opaqueness of Clinton’s gubernatorial records "point to one of the downsides of the Clintons' 40 year public office trek." "The written record is voluminous, and the public record is already full of controversies. All of this comes back in another presidential campaign," he said. This entry was posted in Politics and tagged Bill Clinton, Hillary Clinton. Bookmark the permalink.